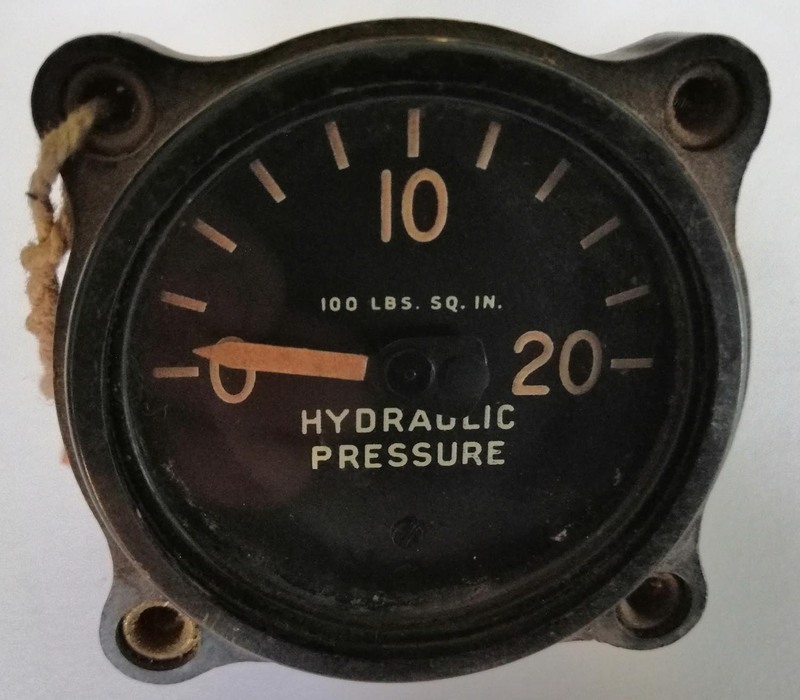 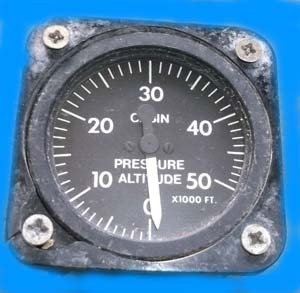 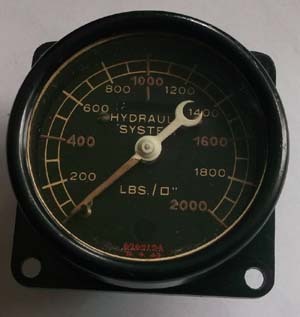 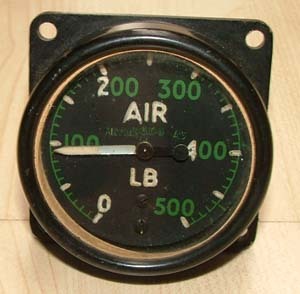 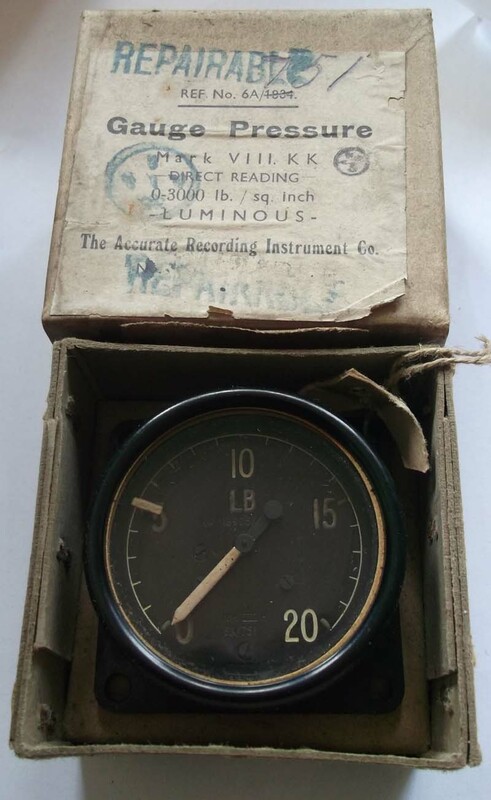 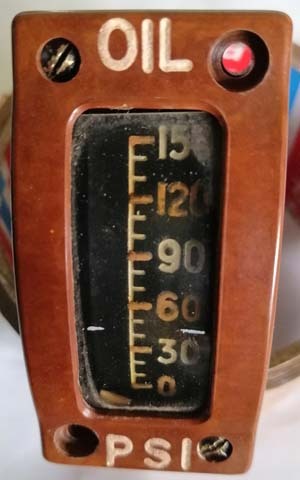 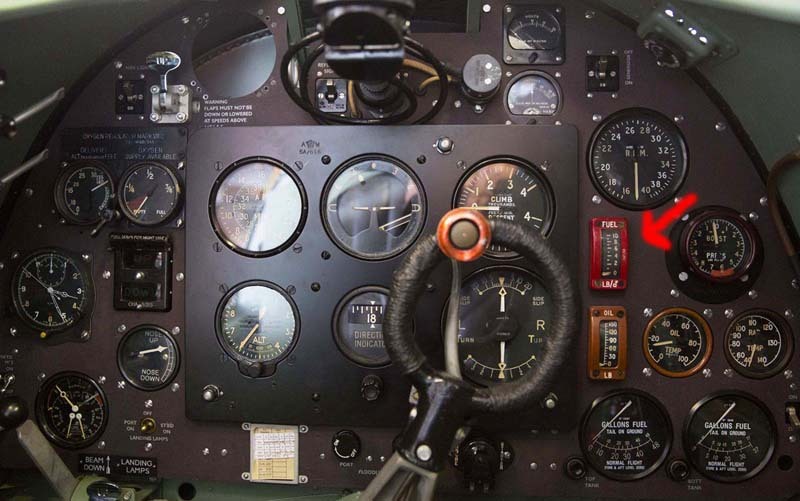 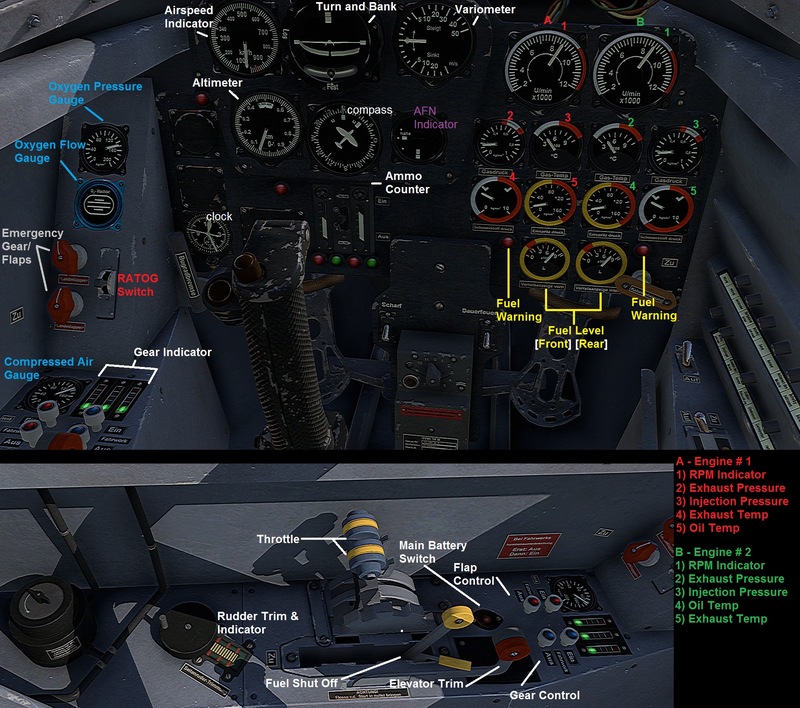 RAF Pressure gauges are generic instruments, the aircraft shown in our adds did use the parts shown but they may of coarse been used in a different type of aircraft . 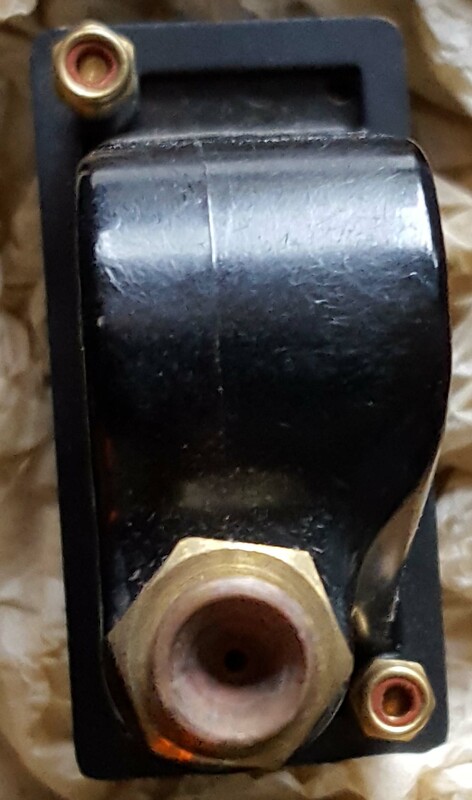 If you are not sure what part you require then please contact us and I will do my best to advise you on the most suitable purchase. 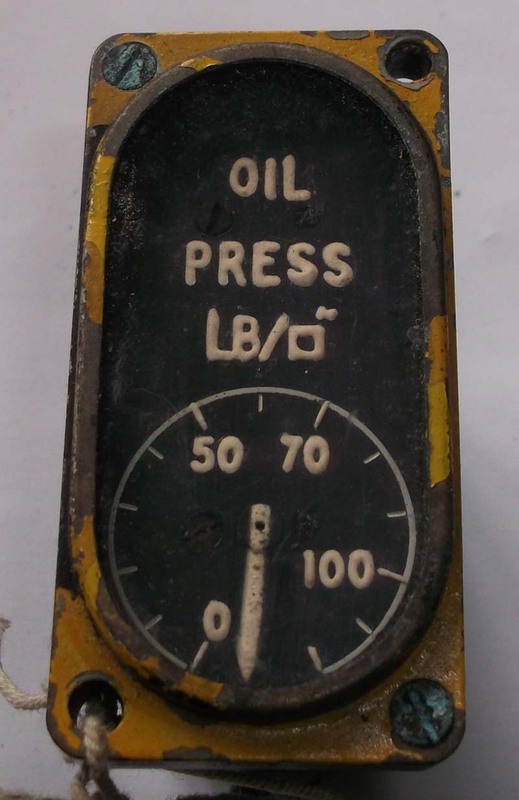 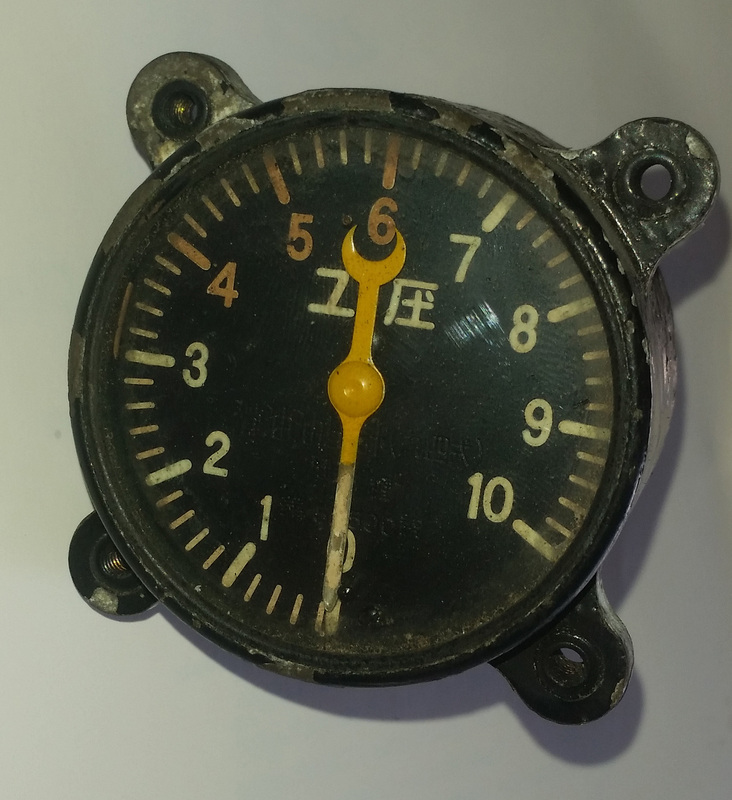 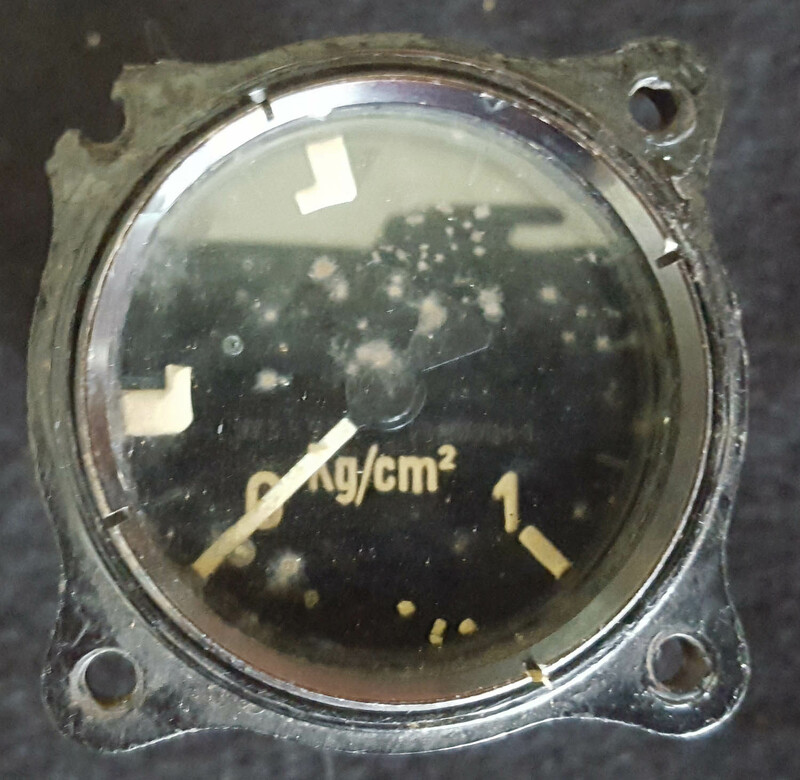 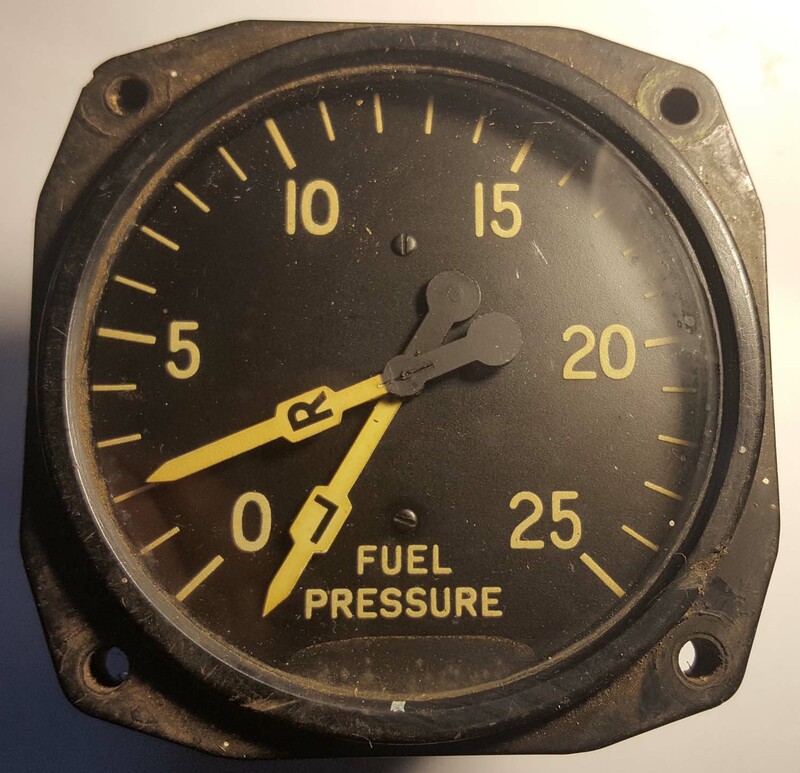 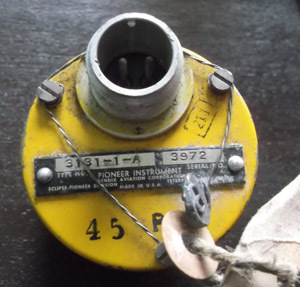 Here is a fuel pressure gauge only used in the ME 262 and the HE 162 German Jets. 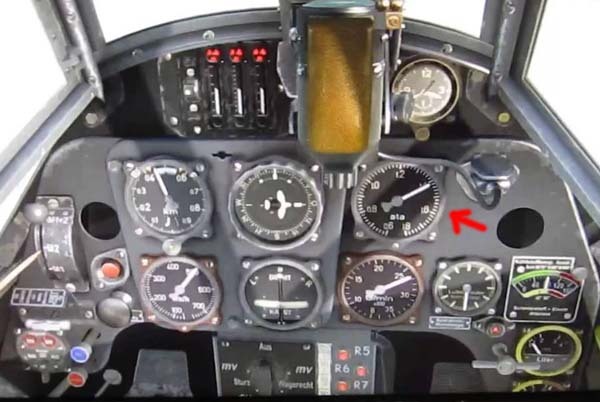 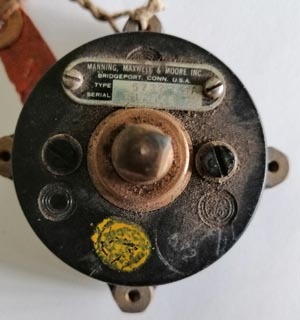 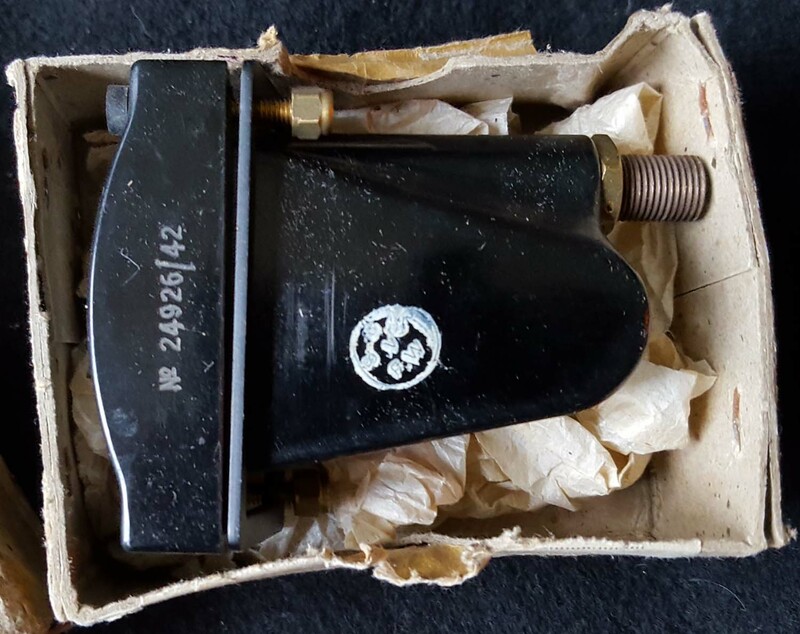 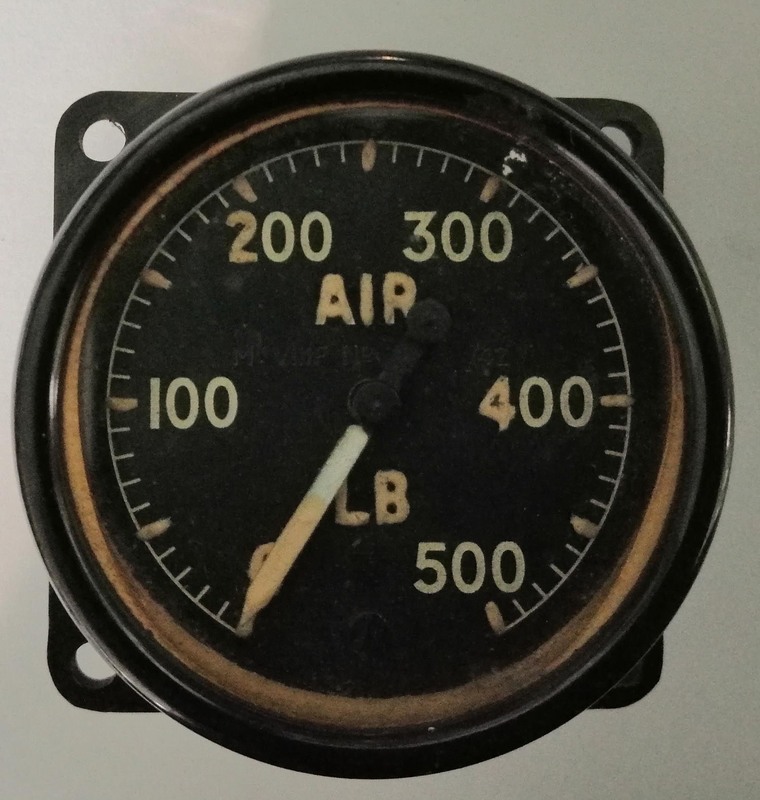 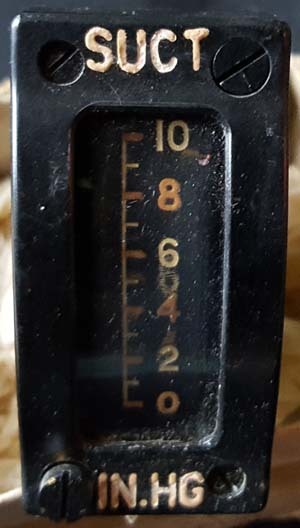 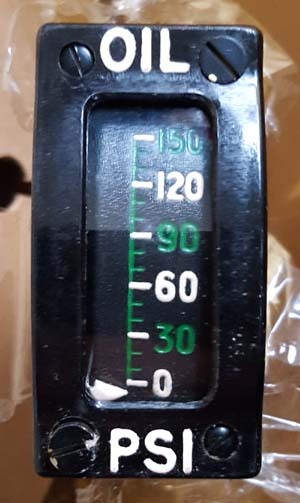 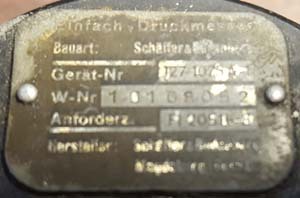 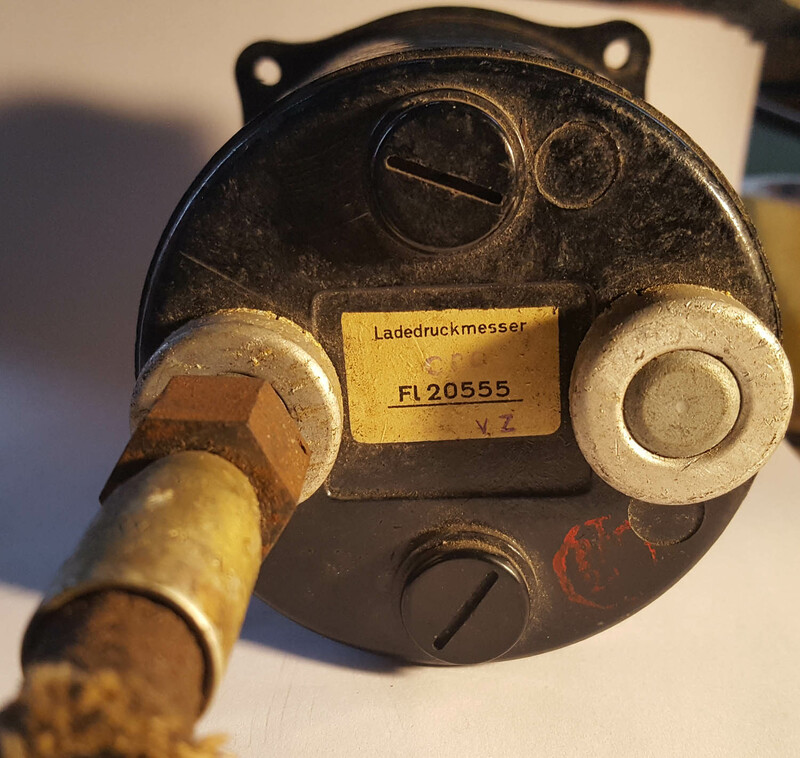 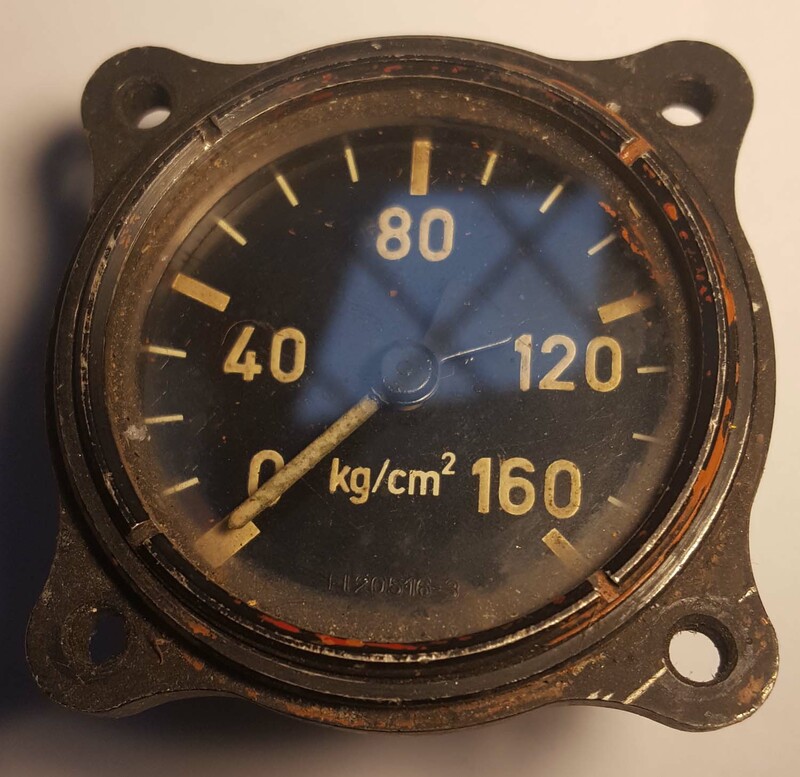 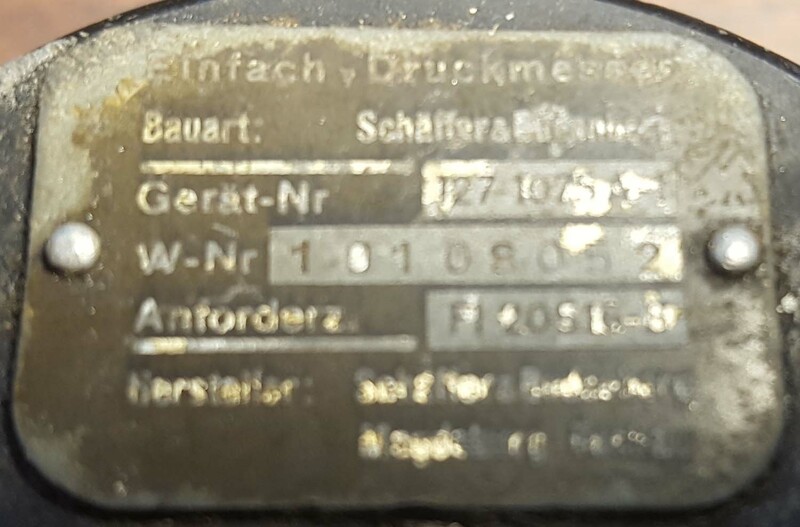 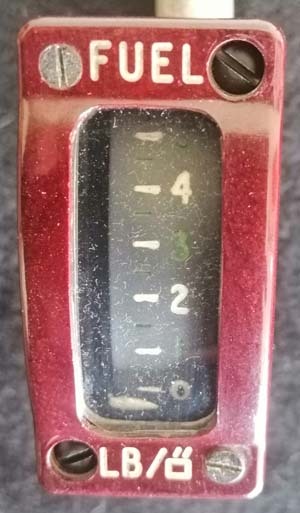 Here we have a German fuel pressure gauge used in the Ar79, Bu131, Bu153, He46, He72, Ju234, Klem L35 all these aircraft are generally late 1930s small German aircraft used for training. 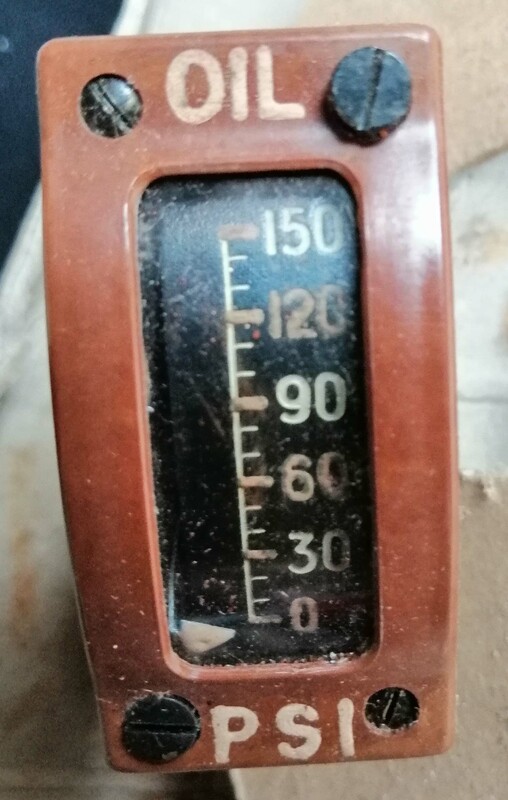 The glass needs a good clean and one lug is broken. This extract was taken from a book produced by Alan Hume. 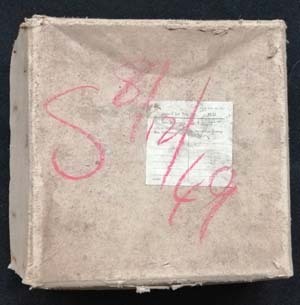 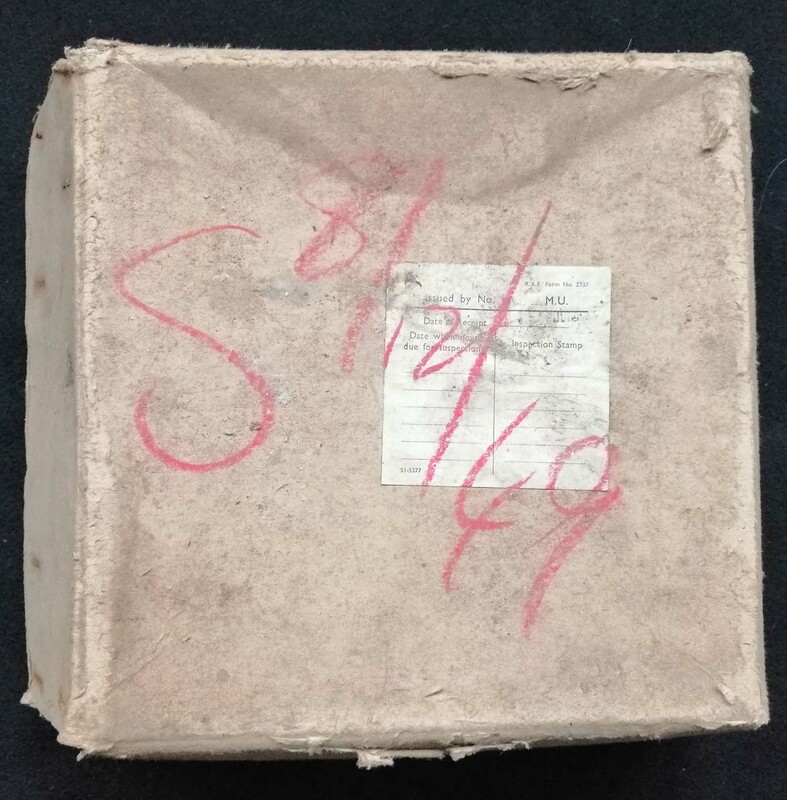 I will be uploading a complete set of Alan's books on a variety of subjects and essential reading for the serious collector and restoration expert alike. There were two types of oil pressure gauge used by the RAF in WWII. 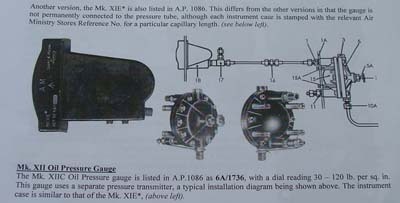 The early type which used a capillary and the MK XIIC which has a threaded tube at the back of the instrument as seen above. 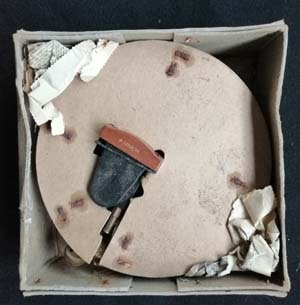 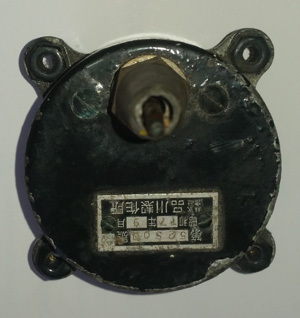 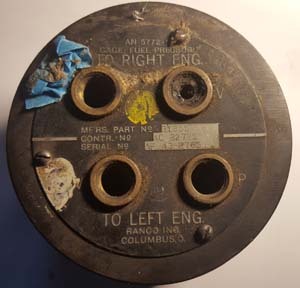 The capillaries are notoriously fragile and a break in the pipe would involve the complete replacement of both gauge and sender as they cannot be repaired once broken, using this type of sender would avoid complete replacement if a fault developed. 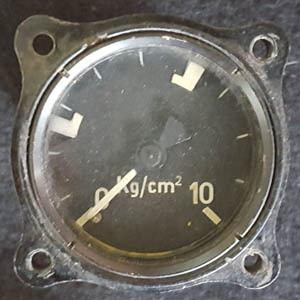 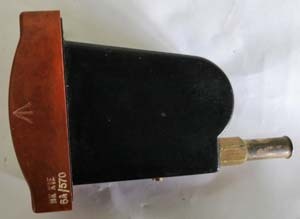 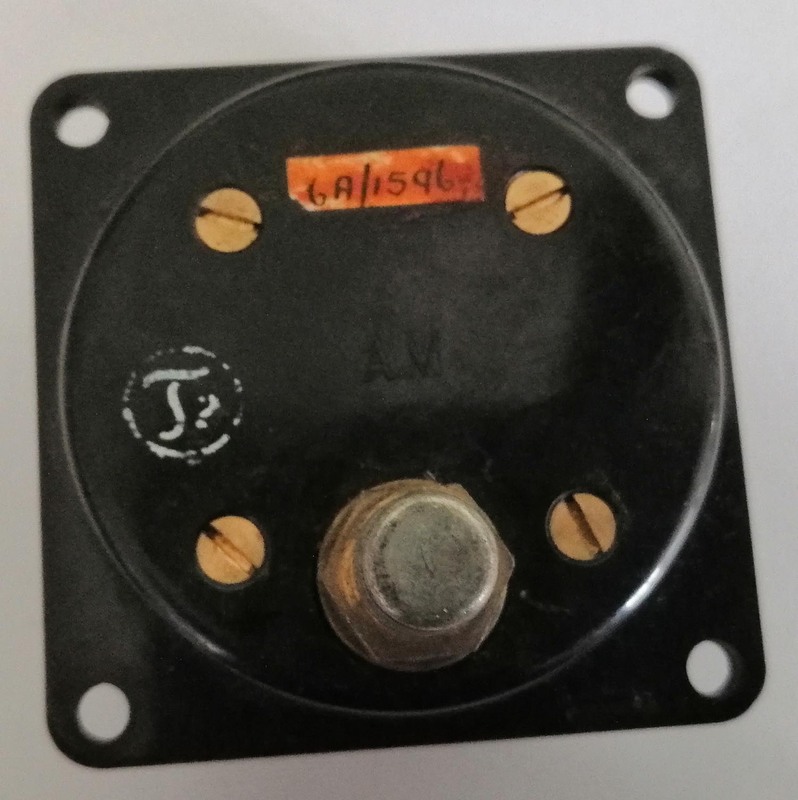 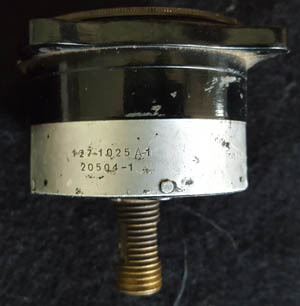 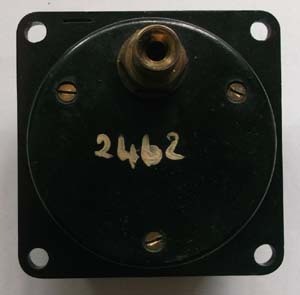 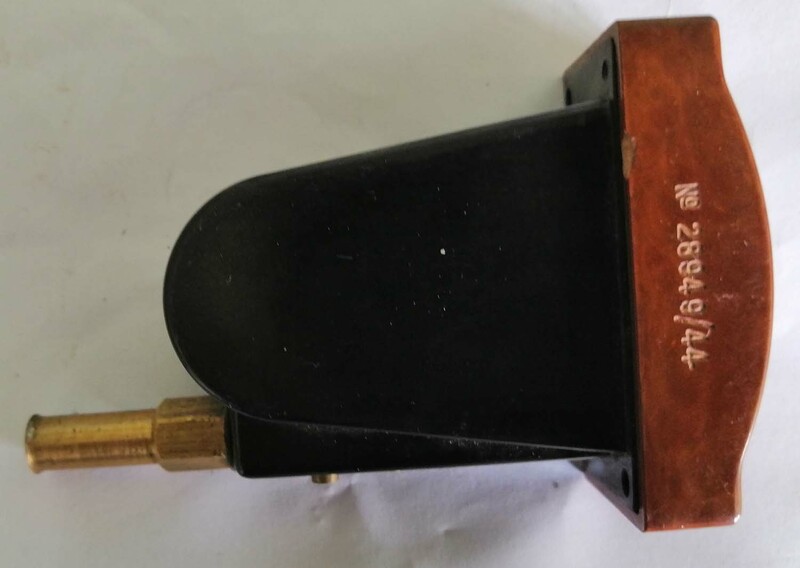 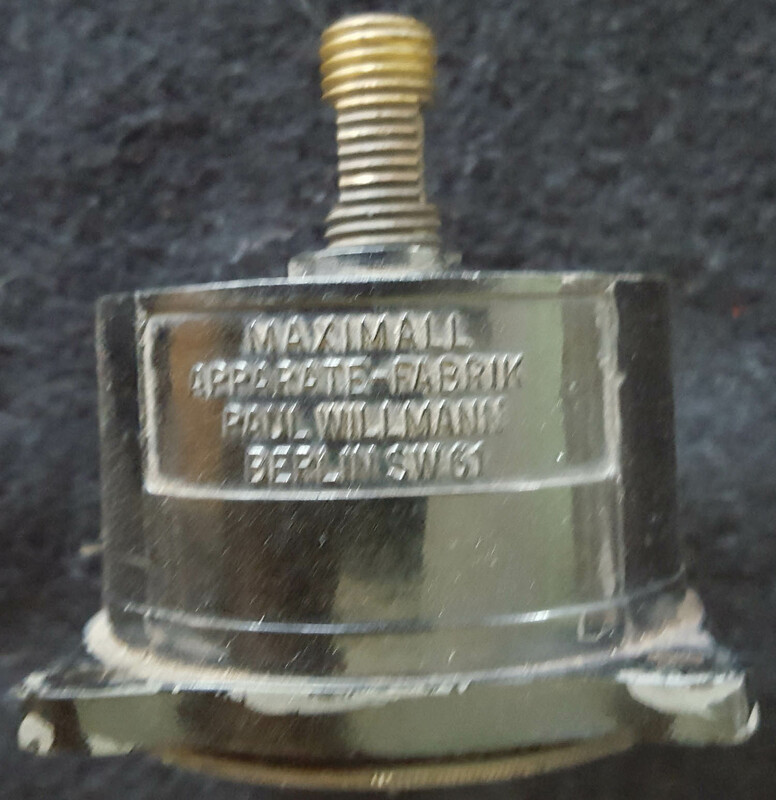 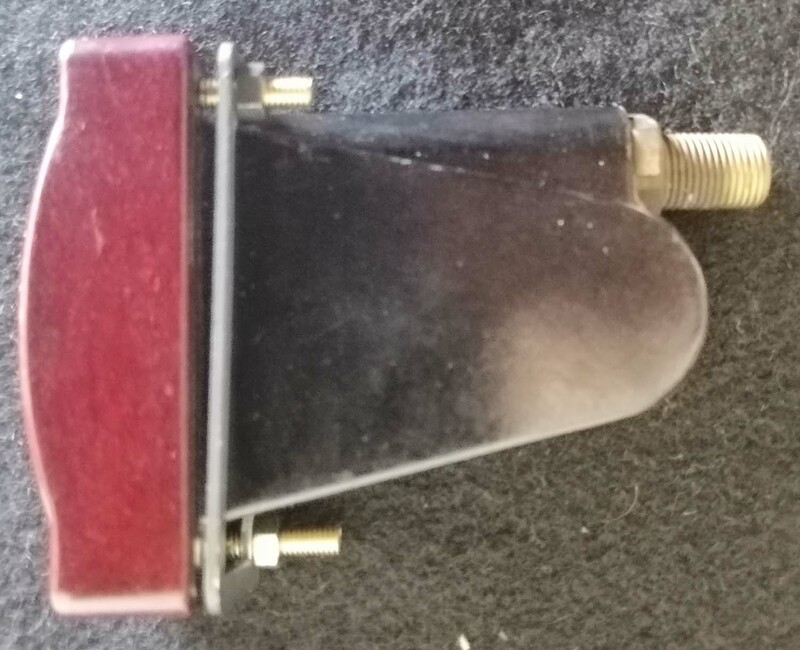 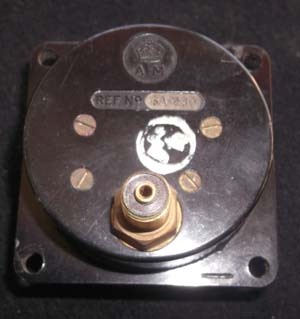 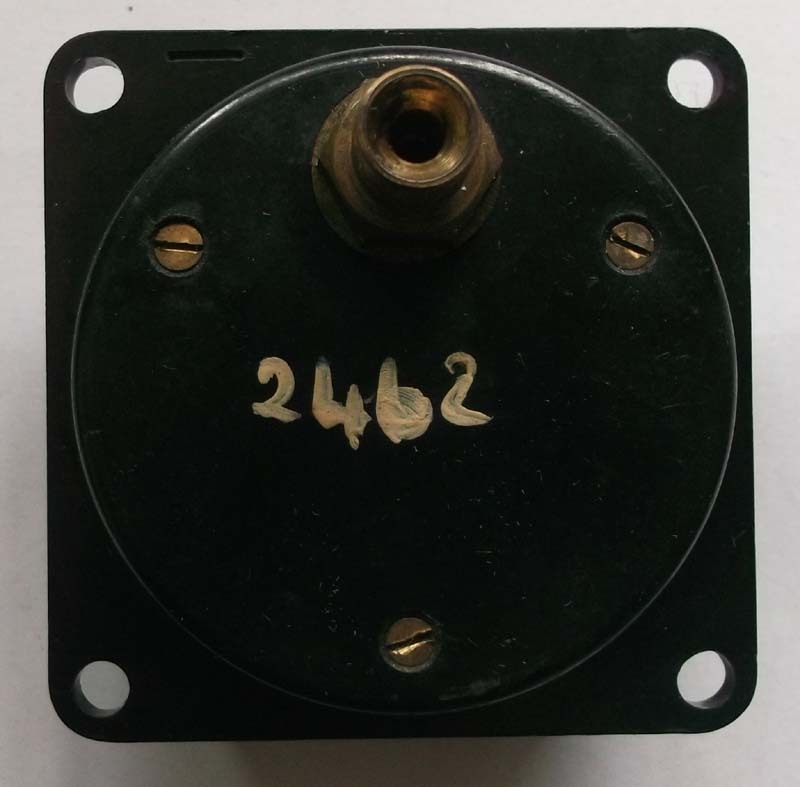 This is the sender unit for this type of gauge. It appears in excellent order with its wire seals intact . 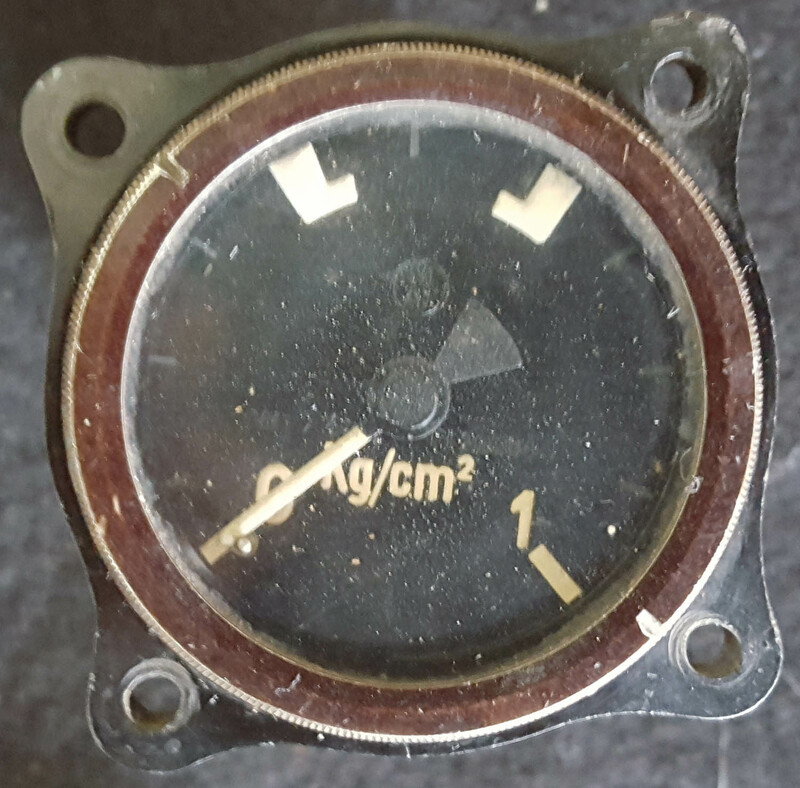 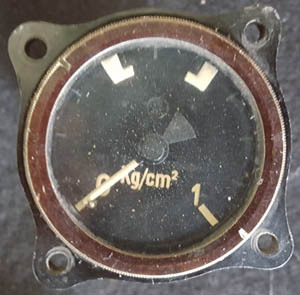 This is a used oil pressure gauge in good original condition. 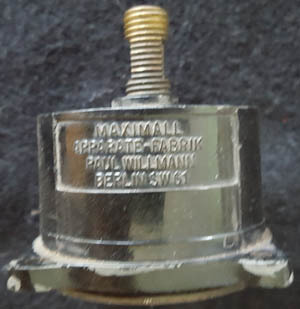 It is a MK XII which uses a separate sender unit and tube. 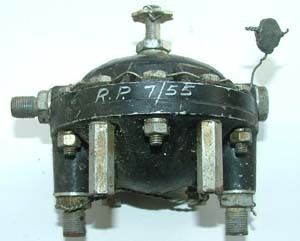 The sender unit is available above. 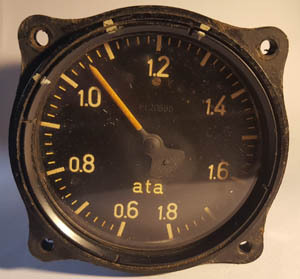 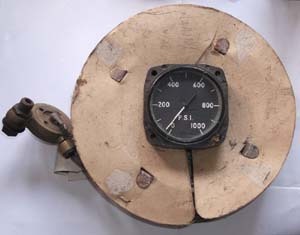 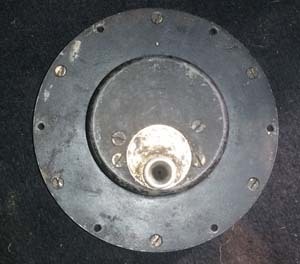 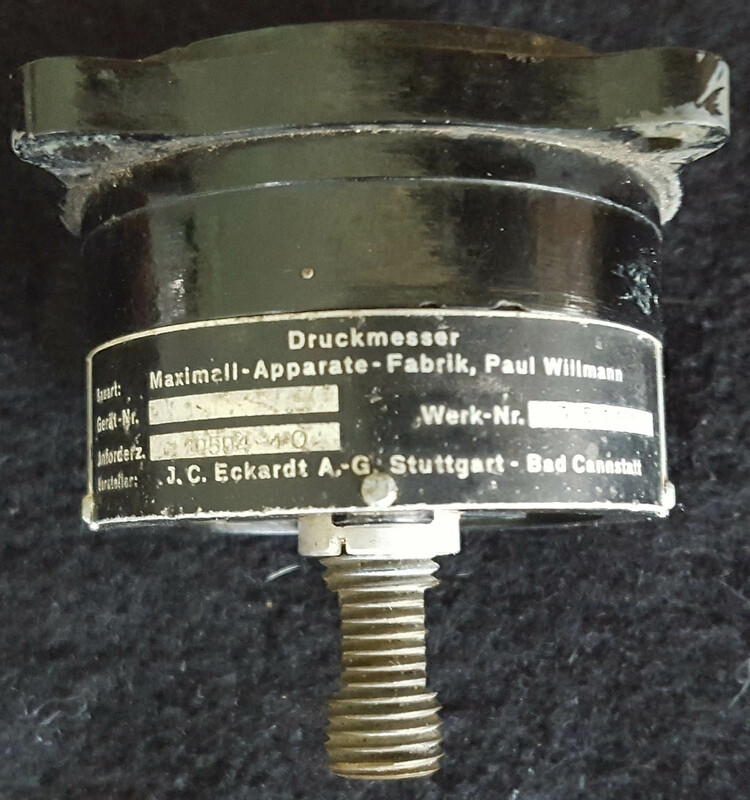 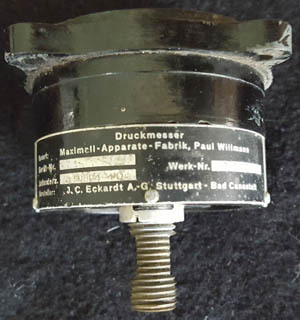 Suction gauge used on the Lancaster main panel. 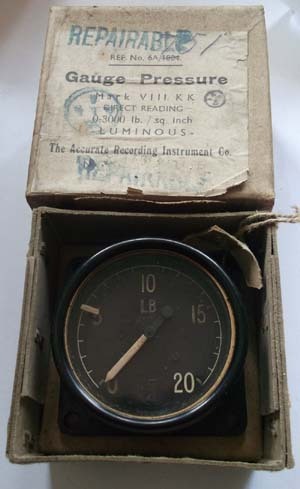 Also used in a variety of other RAF WWII aircraft This is an excellent example in its original box complete with fixing bracket. 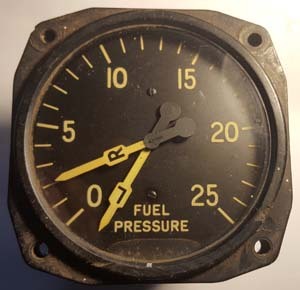 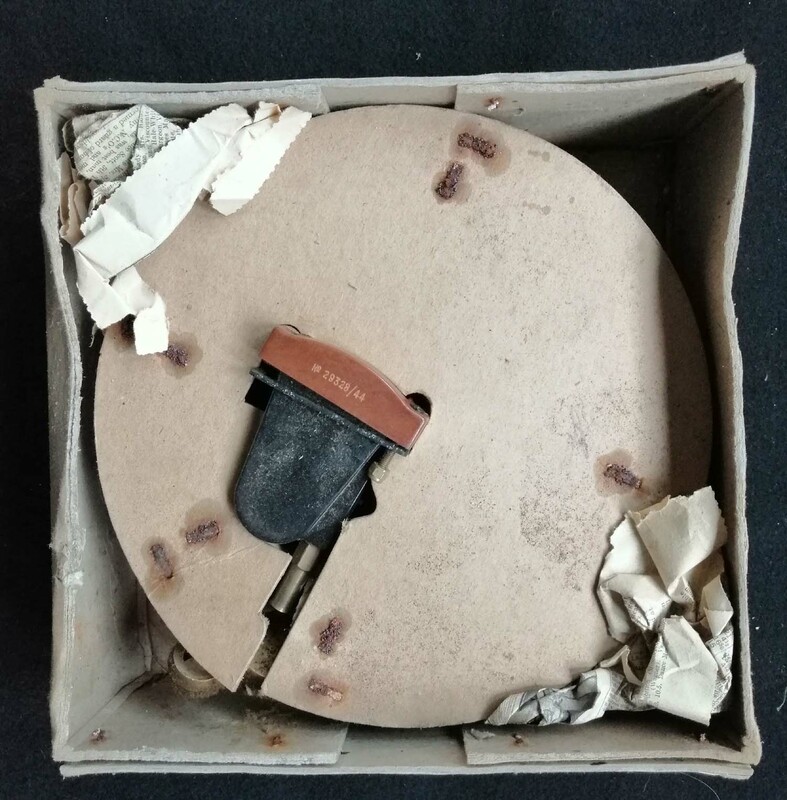 This is a fuel pressure gauge used in the early Spitfire and other RAF aircraft complete with its mounting bracket this model does not use the capillary but is designed to take a detectable tube. Very nice clean condition and very hard to find. 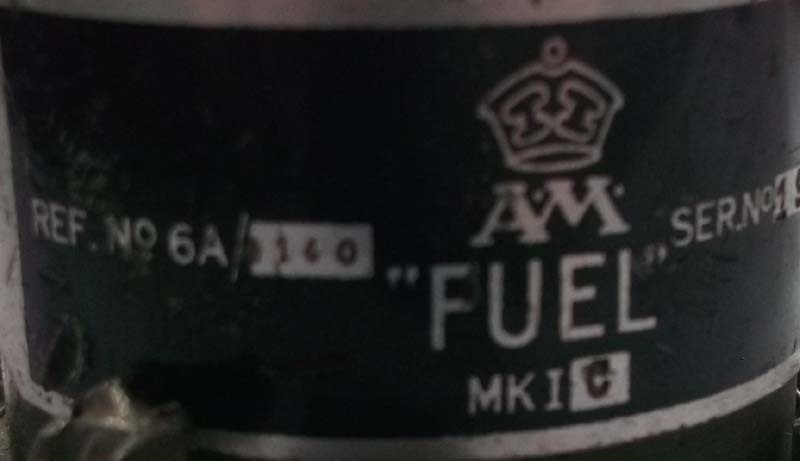 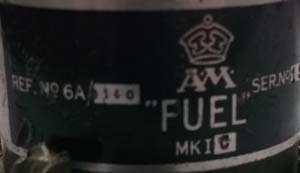 Seen above in situ in a MK IB Spitfire panel. 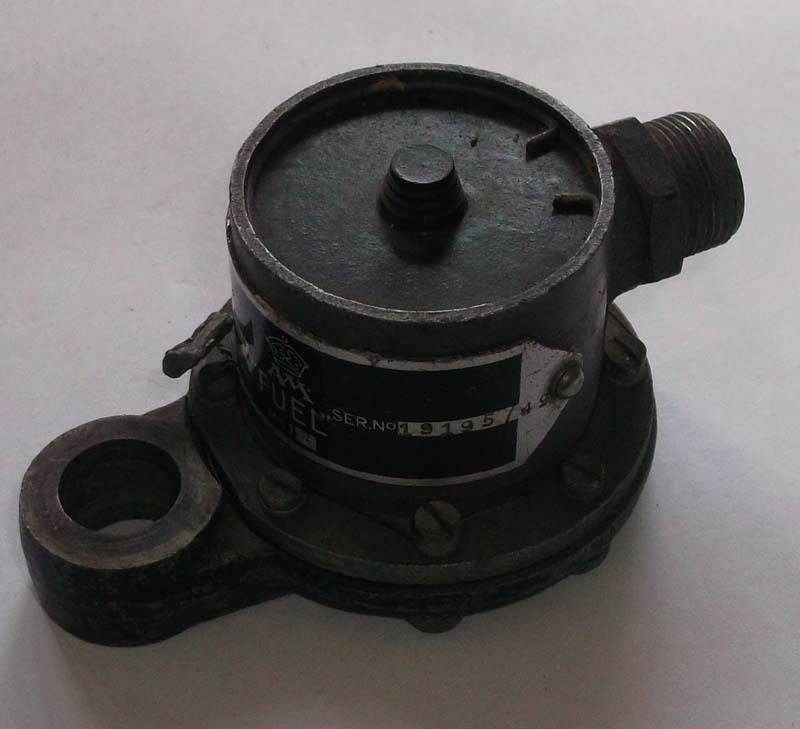 Hydraulic Pressure gauge off a Beaufighter 0-2000Ib. 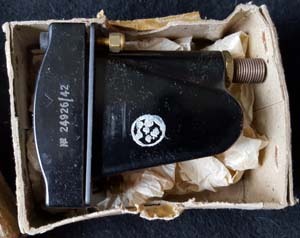 Supplied in original box. 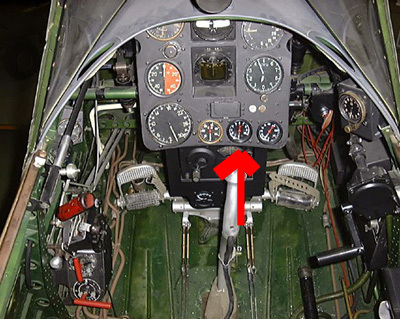 Fitted to Beaufighters, Hurricanes and probably other wartime RAF aircraft. 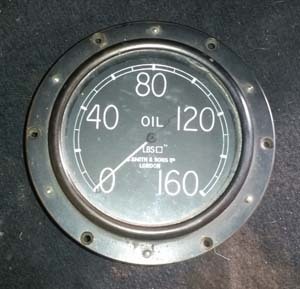 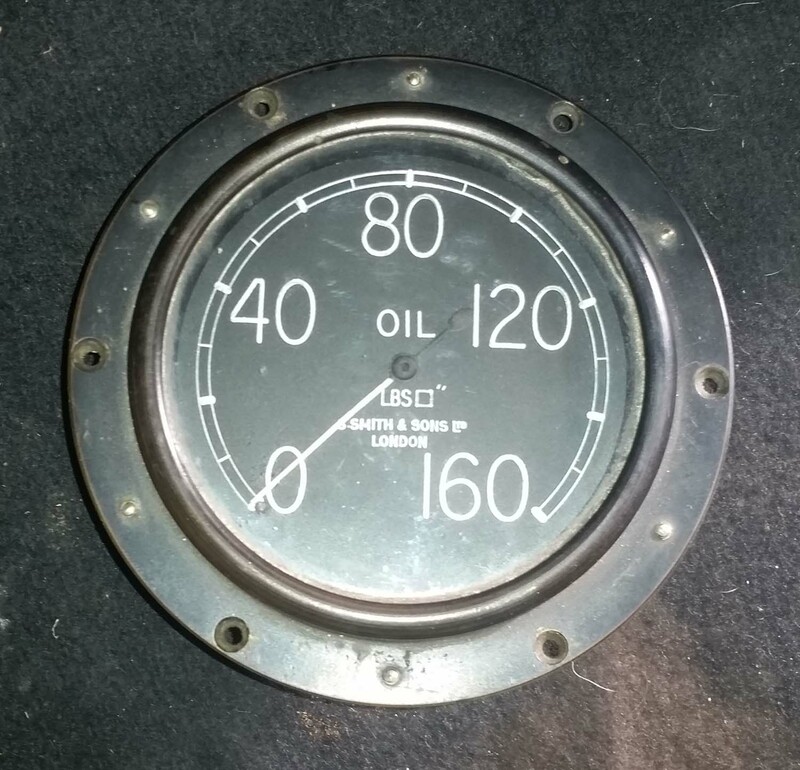 Mint condition unused and sealed oil rectangular pressure gauge with 10ft capillary so for fighter use. 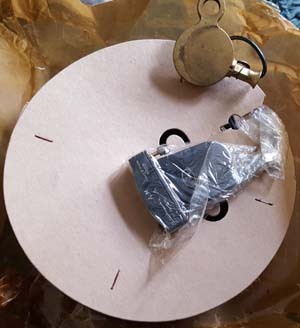 This will be opened once purchased and checked before despatch unless other wise instructed. 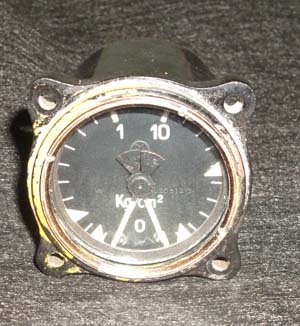 Used in late wartime and early post war aircraft. 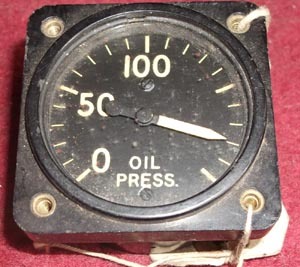 I have seen these fitted to the Avro Lincoln, as with most gauges probably fitted to several types of aircraft. 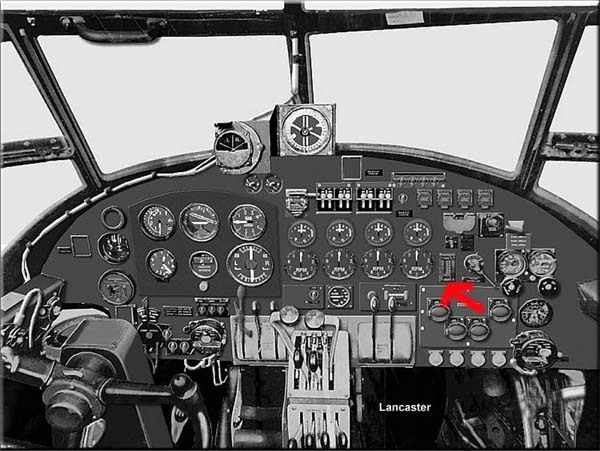 Click on the picture's to enlarge them. This is a fuel pressure sender unit fitted to various aircraft types I have seen these fitted to early Spitfires and even the Swordfish. 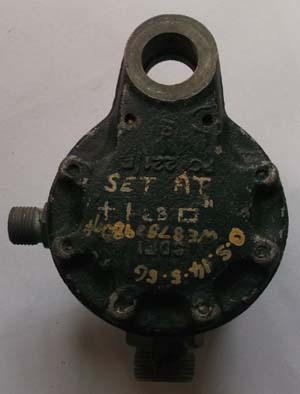 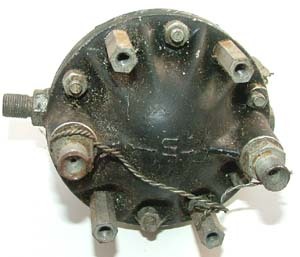 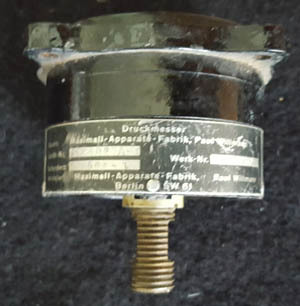 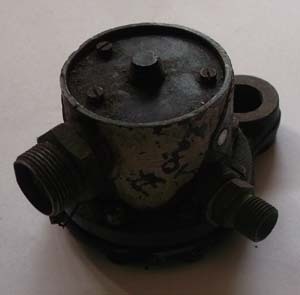 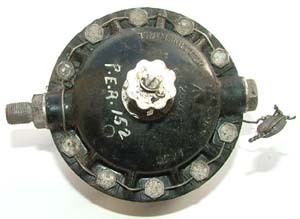 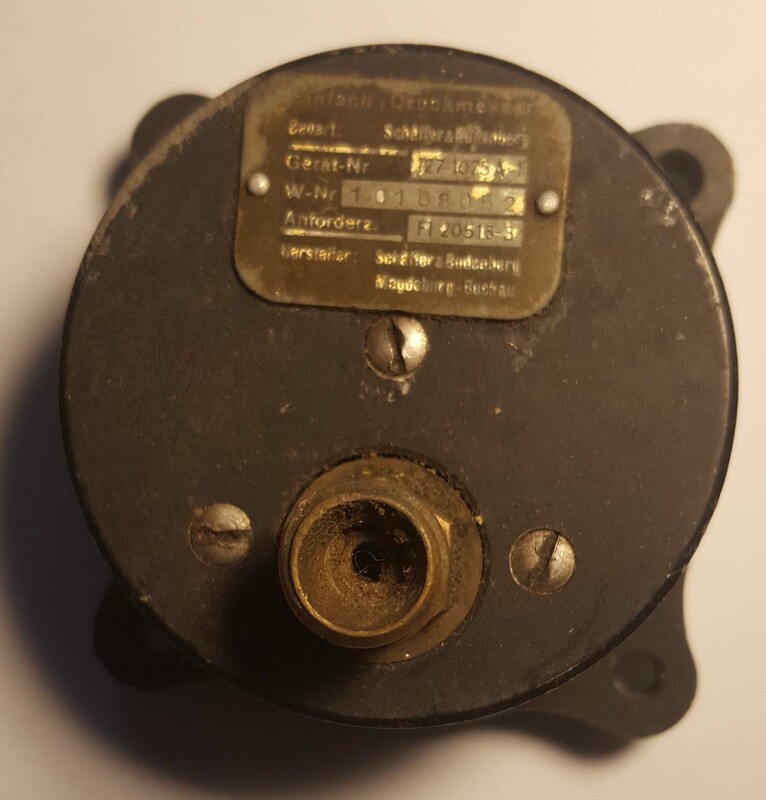 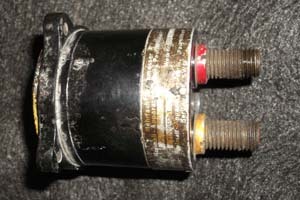 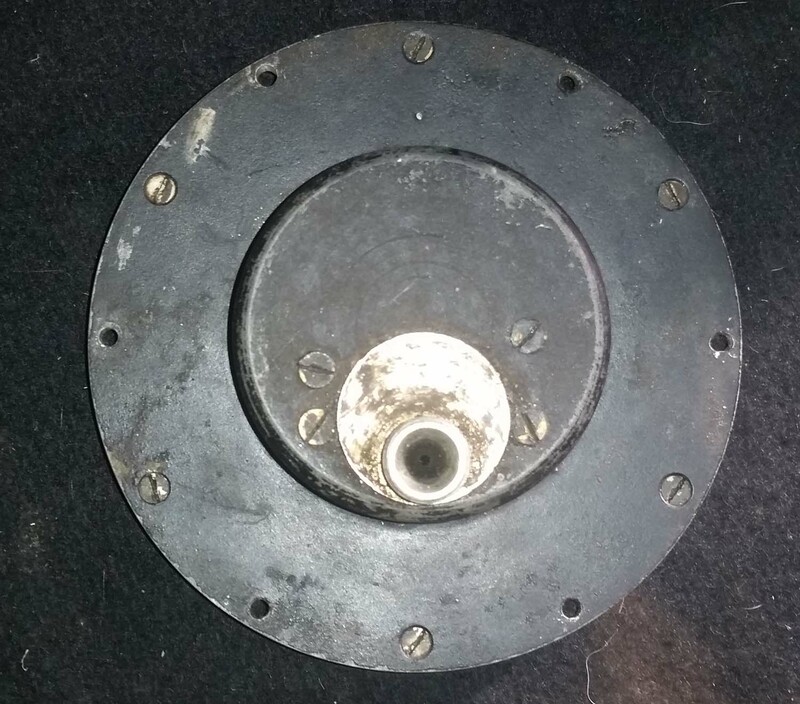 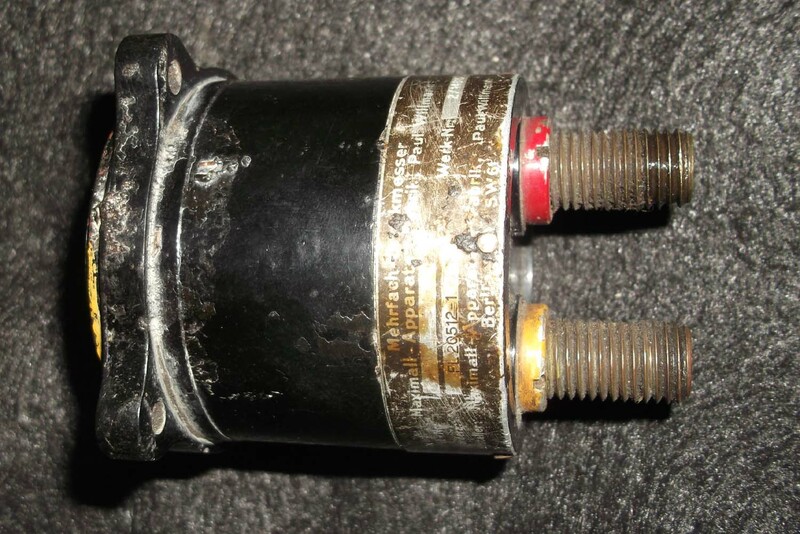 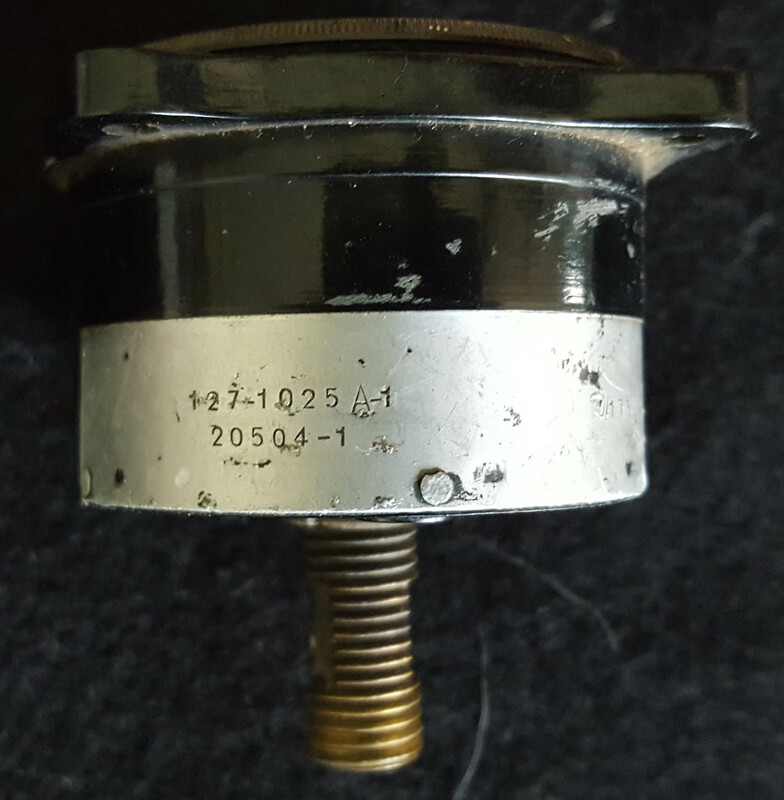 This is a fuel pressure sender unit fitted to various aircraft types I have seen these fitted to Spitfires and even the Swordfish. 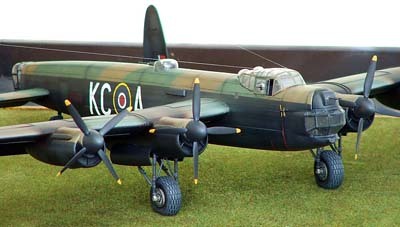 Fitted to Hurricanes and almost certainly other wartime aircraft. 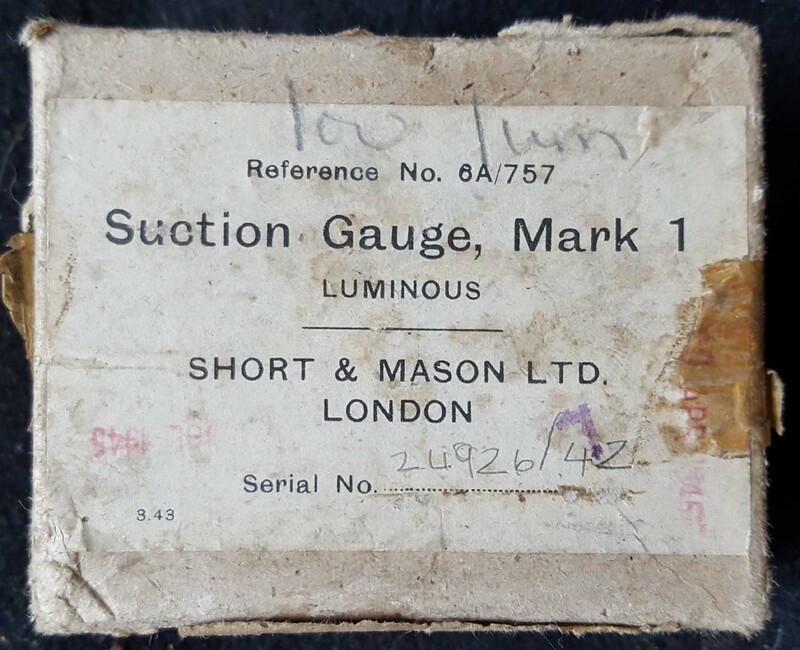 Seen in situ above this is the later type which we also hold in stock. Here is a fuel pressure gauge used in the B25 Bomber , DC 3 and C 47 transport aircraft. Shown above the B25 in the colors of the famous Doolittle aircraft which flew on a one way mission from and aircraft carrier to bomb Japan soon after Pearl Harbor. 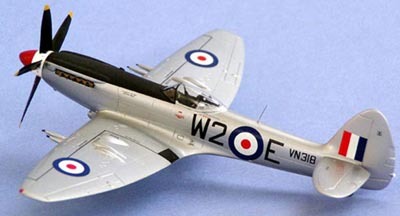 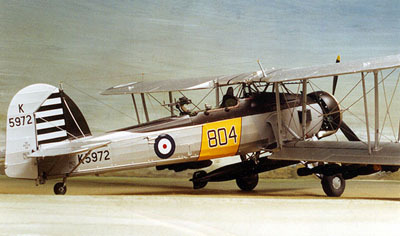 The Grumman Hellcat was also used by the Royal navy during WWII seen under in FAA markings. 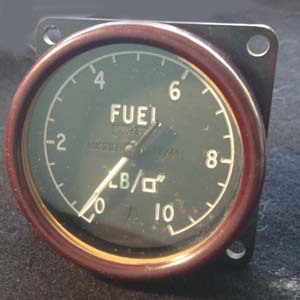 Cabin pressure gauge as used in the Grumman Hellcat. 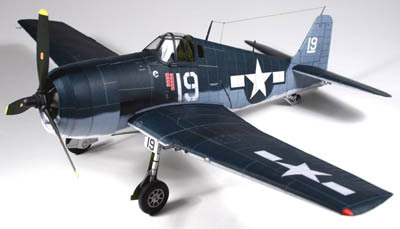 The Grumman F6F Hellcat was the principal carrier-based fighter America had in the Pacific War. 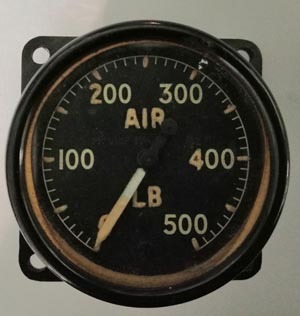 Seen under the Grumman Hellcat. 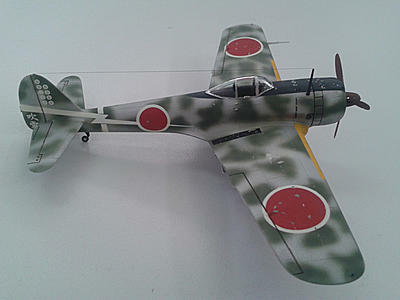 The Nakajima Ki-43 Hayabusa ("Peregrine Falcon") was a single-engine land-based tactical fighter used by the Imperial Japanese Army Air Force in World War II. 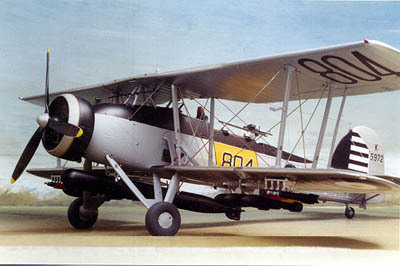 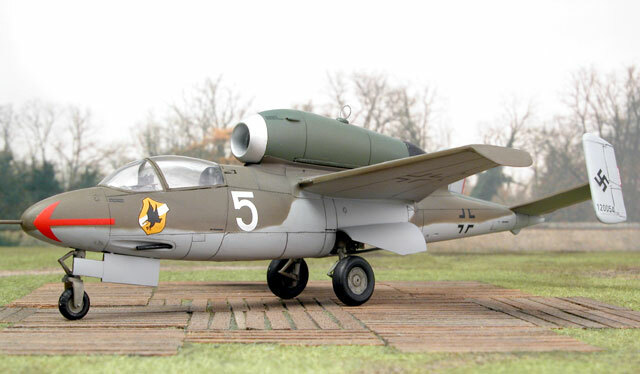 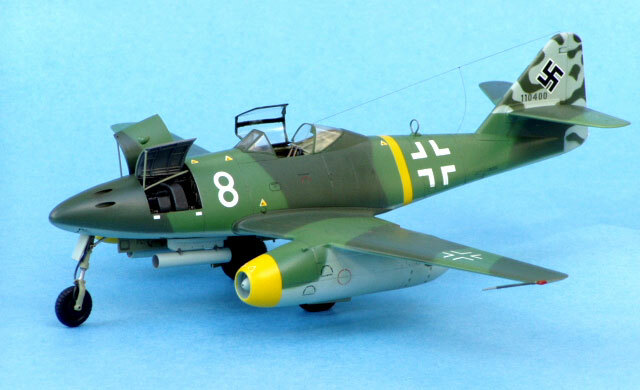 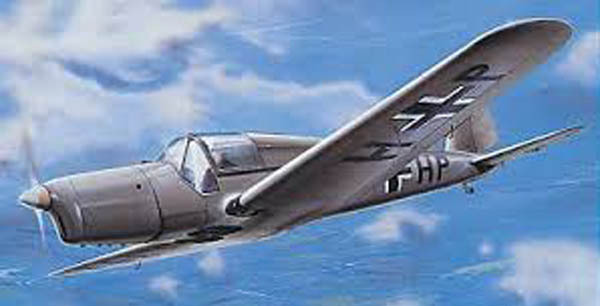 The Army designation was "Army Type 1 Fighter" the Allied reporting name was "Oscar", but it was often called the "Army Zero" by American pilots for its side-view resemblance to the Mitsubishi A6M Zero that was flown by the Japanese Navy.